EVENT SUMMARY. 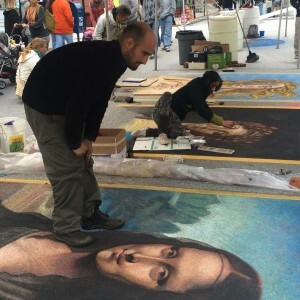 This 3-day cultural event will showcase elaborate chalk paintings created by artists directly on the streets of Little Italy. This free outdoor chalk festival includes live music, street performers, participatory art, an art market and al fresco dining in a celebration of the contemporary renaissance of Baltimore’s historic Italian neighborhood. Our model for this event originated in Italy in a tradition that dates back to the 16th century — the art of street painting. Historically, i madonnari were wandering artists in Italy who traveled village to village to earn their livelihood at various festivals and on various holy days. The artists often depicted religious images in their paintings, thus earning their name. Such a festival was first introduced in America in Santa Barbara, California in the 1980s. Today, street painters create breathtaking traditional and expressionistic compositions using the street as their canvas and chalk pastels as their medium. VISUAL ARTS. Artists will create exquisite classical and contemporary 3D chalk paintings on Little Italy’s South High Street on Friday, Saturday and Sunday, September 6-8. This year, the theme of the art is “Courage.” Professional and student artists will become i madonnari for the celebration. Little Italy proudly hosts Madonnari from around the globe; last year’s artists included Flavio Coppola, Francesca Arsi, Andrea Starinieri, Tiberio Mazzocchi, Carlos Alberto GH, Jennifer Chaparro, Anthony Cappetto and Wendy Stum, Erik Greenawalt, Ever Galvez, Dave and Shelley Brenner, Naomi Haverland, Ken Mullen and Hector Diaz, known internationally as The Chalk Guys, Beatrice Flaig, Nicole Fleig, Andrea Carlson, Sharyn Chan, Michael Las Casas, Lester Mendoza, Abraham Burciaga, Bridget Lyons, Graham Curtis, Holland Winslow, Jesse LuBera, Sara Wenger, Tonya Youngberg, Rebecca Haacke, Jeff Pilkinton, Jasmine Pilkinton, Lissette Aguirre, and Maryland artists, Robin Craig, Barbara Gruber, Jean Razulis, TOVEN, Martha Simons, Bridget Cimino, Keri Lounge Lombardo, Sebastian Sears, Alex Fine and Chloe Elswick, Ariel Brown and Baltimore’s own Maestro Madonnaro, Michael Kirby. Teams of art students from local schools will also create street paintings. Subject to Mother Nature, the art will remain vibrant on the street for viewing on Monday, September 9 and Segway art tours will be available through Segs in the City. PERFORMING ARTS. Local, national and international performing artists,will participate in a series of indoor and outdoor events sponsored by the Little Italy restaurants. This year the Festival organizers are collaborating with the Baltimore Jazz Alliance to present continuous live music under a tented stage. Laura Norris, founder and instructor of Mando for Kids, will lead her young Baltimore City musicians as they play Italian and contemporary music on bowlback mandolins. These emerging artists will be joined by the extraordinary musicians who comprise the Baltimore Mandolin Quartet. Roving opera singers, Kimberly Christie and Jason Buckwalter, and the Park School of Baltimore a cappella ensembles, The Eightnotes and The Vocal Chords, will also perform in and outside the Little Italy restaurants. The Apple Scruffs perform on Sunday evening from the roof of Germano’s PIATTINI in an ode to the 1969 Beatles rooftop concert. PNC CHILDREN’S CHALK CENTER. Also on the weekends, the PNC Children’s Chalk Center, a family Madonnari arts area, will be the site of children’s arts and crafts, stilt walkers and face painters. A comprehensive schedule of art workshops, lectures, music and theater events will be published on the LittleItalyMadonnari.com website and posted in the Little Italy restaurants. AL FRESCO DINING. Attendees will enjoy al fresco dining at Amicci’s of Little Italy, Chiapparelli’s Italian Restaurant, Ciao Bella Italian Restaurant, Germano’s PIATTINI, Isabella’s, Joe Benny’s, La Tavola Ristorante Italiano, Little India, Sabatino’s Italian Restaurant, Tagliata and Vaccaro’s Italian Pastry Shop. ART MARKET. Murals of Baltimore will sponsor an Art Market located on Stiles Street between S. High Street and Albemarle Street. Local artists and artisans will sell paintings, prints, metalwork, woodwork and upholstered furnishings and wearable art. SPONSORS. The Festival is made possible by the generous assistance of the members of the Associated Italian American Charities of Maryland and Columbus Celebrations, Inc. and is organized by the Little Italy restaurants and local businesses, including Amicci’s of Little Italy, Chiapparelli’s Italian Restaurant, Ciao Bella Italian Restaurant, DiPasquale’s Italian Marketplace, Germano’s PIATTINI and Cabaret at Germano’s, Isabella’s, Joe Benny’s, La Tavola Ristorante Italiano, Little India, Sabatino’s Italian Restaurant, Sotto Sopra, Tagliata, Vaccaro’s Italian Pastry Shop, Blanc Noir Bed and Breakfast/Segs in the City, Central Acceptance Corporation, DiPasquale’s Espresso, Frank C. Marino Foundation, Hospital Support Services, Inc., Kennedy Personnel Services, Masonry Solutions, International, National Lumber, and Perry Hall Insurance Brokers, Inc.
Major sponsors include KOHLER Signature Store and Thos Somerville Co., PNC Bank, BGE, an Excelon Company, Miles & Stockbridge, Banfi Vintners Foundation, Workshop Development, Kaiser Permanente, Flying Dog Brewery, Union Craft Brewing Company, VOGA Italia, Folonari Wines, Shanklin Media and the Baltimore LED Art Billboard, the Promotion Center for Little Italy, and Astrachan Gunst. Days Inn Baltimore, Holiday Inn Inner Harbor-Baltimore Downtown, Fairfield Inn and Suites, Baltimore/Inner Harbor, Lord Baltimore Hotel, Kimpton Hotel Monaco, Hilton Garden Inn and Royal Sonesta are the Official Festival Hotel Sponsors. Parking Authority of Baltimore City is the Official Festival Parking Partner. Baltimore Magazine is our Official Media Sponsor. Our museum partners are the American Visionary Arts Museum and the Walters Art Museum. The KOHLER Signature Store is the site of our Madonnari Information Center. OUR MISSION. The mission of the festival is to showcase the exceptional talent, camaraderie and creative spirit of Baltimore. The heritage of the neighborhood of Little Italy is celebrated and artists with new ideas are welcomed in this forward thinking creative community with its enduring traditions. The entertainment continues inside the restaurants in the evening.